Looking out the window, it might feel as though nothing is growing anymore. But winter is actually a terrific season for produce, especially when it comes to fruit. Here, five in-season fruits and the best ways to eat them. The sweet-tart fruits are the perfect handheld snack. Primarily grown in Florida and California, the cold-hearty citrus fruit is in season from about October through April. These killer parfaits are the perfect contrast of cold, crunchy and creamy. A tangerine glaze brightens up this rustic roast chicken. Tangerines are used two ways in this recipe: Sections of the fruit are tossed into the salad, and tangerine juice flavors the vinaigrette. While they may be a chore to break down, pomegranates are some of the best winter fruits around. Available from September through February, their jewel-like seeds are packed with antioxidants. There’s a ton of flavor and texture in this slaw: crisp brussels sprouts, crunchy hazelnuts, salty shaved cheese and bright, tangy pomegranate seeds. The cooling yogurt sauce is delicious with the spiced salmon. This is a perfect winter salad layered with arugula, ricotta salata, salty Serrano ham and pomegranate salsa. There are two types of persimmon available: astringent and non-astringent. Astringent types like Hachiya need to be ultra-ripe to eat, or they're terrible. When ripe, though, they are delicate, sweet and delicious. Non-astringent persimmons like Fuyu are much more forgiving. For a terrific winter snack, layer wedges of sweet persimmon with goat cheese. Roasting persimmons turns the fruit tender and sweet, regardless of the type. Sweet persimmons are terrific with bitter greens like endive. Crimson-fleshed blood oranges are not only striking but also super flavorful and sweet. Because of the intense pigmentation, blood oranges have more antioxidants than regular oranges. 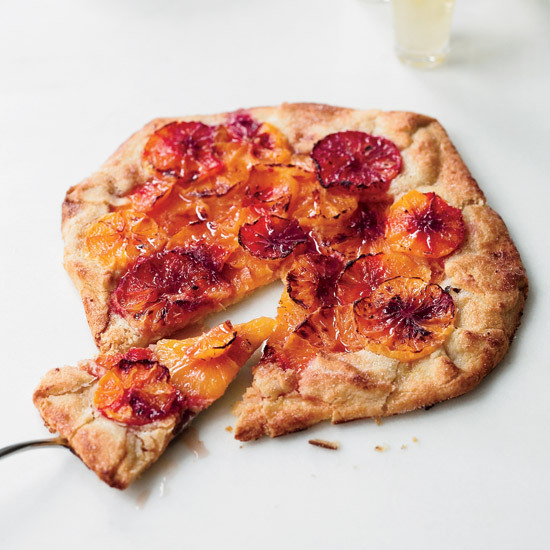 This stunning yet simple crostata is nothing but sweet-tart oranges and a bit of sugar on a flaky, buttery crust. There is a ton of flavor in this simple salad. For a seasonal take on a Screwdriver, swap out regular orange juice for blood orange juice and add a bittersweet splash of Aperol. Nothing brightens up a gray morning like a sweet-tart grapefruit half with a sprinkle of sugar. Of course, the citrus fruit’s flavor isn’t the benefit; grapefruits are believed to help lower cholesterol. This chilled soup is made with just six simple ingredients: fresh grapefruit juice, fennel, lemon olive oil, salt, water and sugar. Jarred pickled onions are usually relegated to cocktails, but this simple recipe combines them with ruby red grapefruit to create a deceptively complex-tasting dish. Crispy sage leaves and a butter grapefruit sauce elevate this otherwise simple dish.